Until the 1950s there was no question. Elected officials were fully in charge. When a 1929 planning commission recommended major downtown improvements council simply voted down its recommendations, as it did calls by an independent engineering firm in 1933 for a new sewage treatment plant on the waterfront. There is no sign of these independent professional bodies stirring up public support for their recommendations, so if they tried to do so their efforts had little effect. In the late war years a planning board, created by council but functionally independent, prepared an ambitious plan for the city and in this case the board, on its own, publicized its plan widely, mounting an exhibition first at the Art Gallery of Toronto and then at Simpson’s department store. But their effort met a similar fate: Board of Control unanimously rejected the plan and the Mayor disbanded the board that devised it. 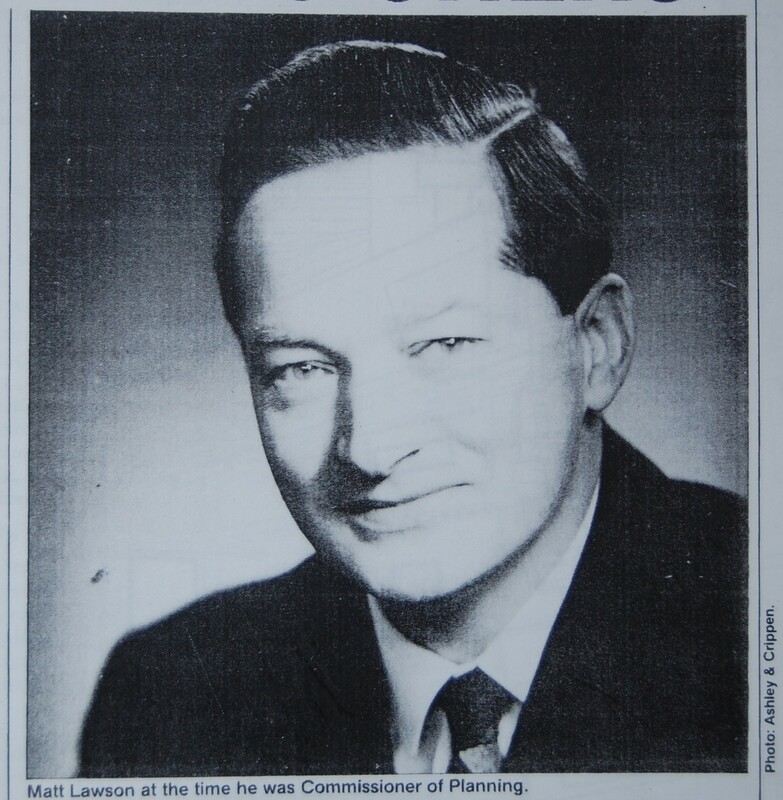 Matt Lawson, at the time he was Commissioner of Planning, probably late 1950s. Notwithstanding this correct answer Lawson was a man who believed in ‘professional prerogative’ and intended to carve out some independence for himself and his planners. His basic strategy was to have the planners work for and report their recommendations to a citizens planning board, not to city council or any of its committees. The board reported to council, so the latter was ultimately in charge; plans, or any recommended actions, were binding only if endorsed by council. But the planning board provided a kind of middle ground, where professional expertise could meet public opinion (of an elite sort) without confronting electoral politics. How well it worked is hard to say. Lawson encountered opposition anyway – council’s approval of Saint James Town against his wishes is evidence of this – and the Mayor and council went so far as to create a “Development Department”, which did report to council, to facilitate development that the politicians felt the planners were impeding. But Lawson had his successes too, neighbourhood by neighbourhood, and the city benefitted from his introduction of planning expertise into the city-building process. The situation changed quite substantially during the reform regime of the 1970s. By and large the reformers did not look kindly on what the city planners were advocating in the late 1960s – high-rises in residential areas well-served by public transit, urban renewal and public housing projects in low-income neighbourhoods, a metropolitan expressway system. And they led the way in reforming the system – restricting downtown commercial building heights, protecting older low-rise neighbourhoods, fostering a middle-class residential inner city, and ceasing to build major roads. Despite their reformist zeal these politicians rarely crossed swords with the planners, partly because planning itself was changing and a rising contingent of newer planners on staff made common cause with the politicians – prompting some resignations among the more traditional planners – but also because a vacuum existed atop the planning apparatus. Matt Lawson had retired in 1967 and been replaced by another Englishman, Dennis Barker, but on account of poor health Barker kept out of any intense battles. His senior assistants carried on ably but one cannot help think that the absence of a vigourous Chief Planner made it easier for politicians to gain and hold the upper hand as well as, perhaps, for the new planners to gain influence. In any case, mayor and council won this round. So history shows that conflict between planners and elected politician is not uncommon and that the politicians generally get their way, making the current Keesmaat/Tory rift one in a long line – a significant, if not terribly surprising, lesson from history. What strikes me as more interesting is what was lost when electoral politics won, and the answer, it seems to me, is “something”. Planners generally know what they are talking about, despite what politicians say. They can, admittedly, be overly influenced by prevailing international orthodoxies and, as such, insensitive to changing circumstances or local conditions. But more often than not their expertise speaks for a broader, long-term public interest that elected politicians and their locally-minded constituents do not, and cannot be expected to, represent. Matt Lawson, for example, was a relentless advocate for a more beautiful downtown with pleasant pedestrian routes and accessible open space. But this was not something the city’s middle-class voters, for whom downtown was primarily a place for daytime work, or its downtown commercial property owners were keen to pay for, and their parsimony kept downtown Toronto less beautiful than it might have been. And the much-lauded politicians of the 1970s reform movement, focussed as they were on the inner city, had no time for planning ideas that pertained to the metropolitan area overall (one being the first serious proposal for an Eglinton subway). Ms Keesmaat’s position in favour of replacing the overhead expressway with a ground-level boulevard is no more a “political” stance than Lawson’s position in favour of a more refined downtown. Keesmaat represents the perspective of a host of well-informed experts who have studied the matter inside and out – at considerable public expense one might note – for years, and who speak for the city overall, not just for those who live nearby. If elected politicians choose to disregard that expertise they may do so because they believe the experts are wrong, in which case it is incumbent on them to tell us why – and they could well have good reasons – or they may believe that by doing so they will get more votes in these traffic-congestion-fearing days, in which case it is they who are taking a purely political stance. Whatever the reason, history reminds us that something is often lost when they do. Surely nothing is gained by telling the experts to keep quiet. SOURCES: Pasternak quote from Ann Hui, “The Unstoppable Jennifer Keesmaat”, The Globe and Mail, 12 June 2015; Lawson quote from “Matt Lawson, Toronto’s Commissioner of Planning, 1954-1967”, City Planning 3, 1: 3–6 [University of Toronto Library]; portrait scanned from same, original photo Ashley and Crippen, used with permission.